Later edition of Lewis Evans' map, considered a milestone both for its political significance and expansion of cartographic knowledge. Carte Generale des Etats de Virginie, Maryland, Delaware, Pensilvanie, Nouveau-Jersey, New-York, Connecticut et Isle de Rhodes Ainsi que des Lacs Erie, Ontario, et Champlain. D'Apres la Carte Ameriquaine de Louis Evans et la Carte Anglaise de Thomas-Jefferys. A scarce French edition of Louis Evans' highly influential map of the Middle British Colonies, one of the most important maps of the British Colonies to appear in the 18th century. The map covers Louisville on the Ohio River eastward as far as Narragansett Bay and Long Island, northwards as far as Montreal, and south to the mouth of the Chesapeake Bay, inclusive of Lake Erie, Lake Ontario, and most of the Ohio River Valley. A large inset map in the upper left quadrant is entitled, 'Esquis se duresse de la Riviere de l'Ohio,' and details the course of the Ohio River from the Mississippi to Lakes Michigan and Huron. Unlike most previous maps of this region, including the Mitchell map referenced above, Evan's based this map heavily on actual survey work personally undertaken. This he supplemented with first hand reports from frontiersman and guides well acquainted with the area. Evans issued this map just at the French and Indian War was getting underway. With the construction of this map Evens no doubt hoped to offer solid foundation for British settlers to occupy these soon-to-be hotly contested lands. The result was a map of surpassing quality and long-standing influence that maintained its position as the definitive map of the region for over 50 years. In addition to its broader significance, this map abounds with fine detail - the kind of information that would be exceptionally useful for a prospective settler - and rewards close study. It depicts hundreds of European and Native American settlements, as well as numerous roads and the sites of swamps, mountains, resources, and important portages. In addition, Dartmouth College is identified on the Connecticut River, 'elephant bones' and 'Antiques Sculptures' in Ohio, salt and limestone quarries throughout, petroleum in western Pennsylvania, and coal deposits. As with most great maps, the Evans map was extensively reissued and pirated, going through 27 known editions over the subsequent 50 years. The present example was re-engraved by Pierre Tardieu based upon the Jefferys update of Evans' original chart. It was intended for publication in accompaniment of Michel Guillaume St. Jean de Crevecoeur's 1787 Lettres d'un Cultivateur Ameriquain (Letters of an American Farmer). Lewis Evans (1700 - June 11, 1756) was a Welsh born American surveyor and geographer active in Philadelphia and the Ohio Valley in the first half of the 18th century. He was born in Llangwnadl, Carnarvonshire, Wales - a fact which he revealed in his will. Otherwise little is known of his early life. The first mention of Evans is his purchase of Edward Cocker's Arithmetick at Benjamin Franklin's Philadelphia bookshop on November 27, 1736, so he must have immigrated to the colonies sometime before this. There is some suggestion that Evans may have traveled extensively abord, even as far as Asia, but this is largely unsubstantiated. His cartographic corpus is small but significant. 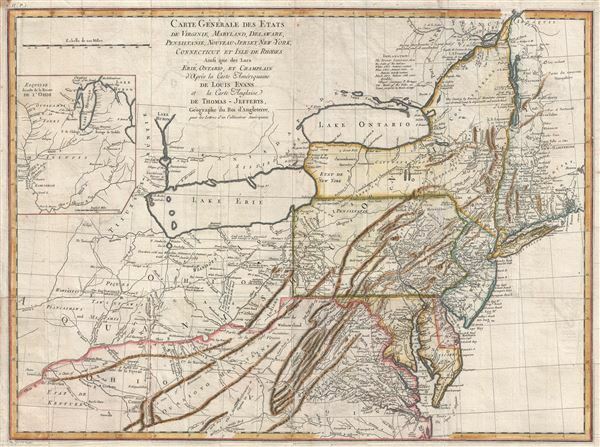 Other than a number of minor survey maps focusing on holdings in eastern Pennsylvania, Evans's published only two major maps, A Map of Pennsylvania, New Jersey, New York, and the Three Delaware Counties and A General Map of the Middle British Colonies in America, the latter being a most significant and a landmark production focusing on Trans-Appalachia. It is noteworthy that Evans was a meticulous cartographer and, unlike most mapmakers of this period, based his maps an actual survey work which he personally conducted. Evans died in Philadelphia on June 11, 1756, one year after his greatest work was published. The body of Lewis Evans lies in the Christ Church Burial Ground in Philadelphia. After his death, his only daughter Amelia was brought up by Deborah and Benjamin Franklin. Pierre François Tardieu (1711 - 1771) was a French engraver and mapmaker active in Paris during the middle part of the 18th century and a member of the large and prolific Tardieu family. Several members of the family established themselves as engravers, and, for over 200 years, the family produced works. Pierre Francois Tardieu was born around 1711 in Paris, son of Jean Tardieu. His uncle, Nicolas-Henry Tardieu, taught him the art of engraving. Pierre was a general engraver whose work was not limited to maps but also included historical and genre works. Many of his maps are extremely significant and include some of the finest French productions of the period. Tardieu had his office at Rue de al Corderie, Paris. Tardieu was married to Marie-Anne Rousselet (1733-1826), whose family included the engraver Gilles Rousselet and the sculptor Jean Rousselet. It is highly likely that Pierre Francois Tardieu was succeeded by Pierre Antoine Francois Tardieu, who is also possibly his son, as the latter continued to engrave under the P. F. Tardieu imprint well after the former's death. Crevecoeur, Michel Guillaume St. Jean de, Lettres d'un Cultivateur Ameriquain, (Paris) 1787. Very good. Slight wear along original fold lines. Right margin expertly extended. Blank on verso. Platemark visible. McCorkle, B. B, New England in Early Printed Maps 1513 - 1800, 787.6. Schwartz & Ehrenberg, The Mapping of America, p.162, pl. 98. Klinefelter, W., 'The Maps of Lewis Evans', Transactions of the American Philosophical Society, New Series, Vol. 61, No. 7 (1971), pp. 3-65. Streeter, Lewis Evans His Map, pp.17-28. Pritchard and Taliaferro, Degrees of Latitude, p. 172. Stevens, Henry N., Lewis Evans: His Map of the Middle British Colonies in America.